Everted mouth; tapering body; circular foot. Includes knobbed cover. Bowl's body and surface of cover are carved with floral sprigs. Upper section of knob and lower section of circular foot are unglazed. Clear glaze covers entire vessel. Tea ware. Condition: Intact Old Accession Card: Bowl and cover, the bowl with a low foot and rounded sides, and the cover of inverted saucer shape with a low spreading foot. 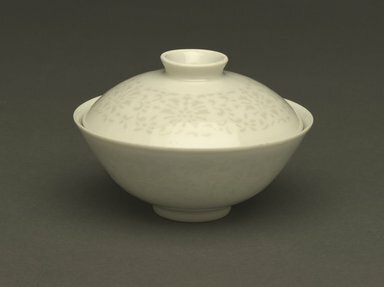 White glazed porcelain, both bowl and cover decorated with bands of stylized flowers and leaves cut through the paste and later covered up by the glaze, a type of decoration known as rice grain. The bases of both bowl and cover are glazed white and have six character Ch'ien Lung [Qianlong] seal marks written in underglaze blue.